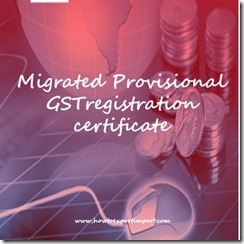 What does MIGRATED PROVISIONAL REGISTRATION CERTIFICATE mean under GST in India? Once an existing tax payer in India applied online for GST registration in India by filling all required information online by saving data finally, a status of application is communicated to the applicant as Provisional pending signature, Migrated, Active or Suspended. If all required information filled up correctly and fed with GST common portal as per required data by an existing tax payer in India, status of such application for GST registration shows as “Migrated”. 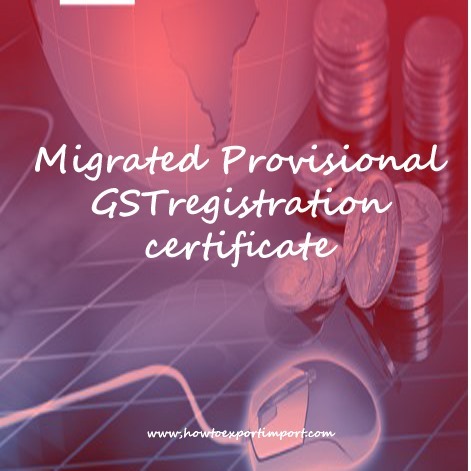 Migrated Provisional GST certificate means, the existing tax payer has completed the procedures and formalities to migrate to GST registration. The status “Migrated” becomes “active”, once GST gets implemented in India. The final Registration certificate will be issued to those who electronically sign the completed Enrolment Application and the same is verified by the proper officer.